Cats are sometimes the fussy eaters of the animal kingdom. Some cats don’t like tough, cracker-like foods, while there are also cats that prefer this over the jelly-like consistency in others. There are expensive food items that are made specifically for the sensitive tummies of small kittens and there are also cheaper options for the more tolerant breeds. Cat food also comes in a range of flavors from barbequed meats to fresh seafood, so your feline friends will never grow tired of eating. However, there are cat owners out there who are currently having some trouble trying to get their pet to eat. Hopefully, this cat feeding guide can help you make mealtimes a much more pleasant experience for everyone involved. Feeding cats doesn’t have to feel like a chore. Just follow these few simple reminders and you’ll get your cat eating fuss-free in no time. The first thing you can do is to switch up your cat’s feeding schedule. You can either give your cat a fixed feeding schedule or you can have them eat whenever they please. You could even use a combination of the two when trying to get your pet to eat. Each of these methods have their own specific advantages as well as disadvantages, so choose wisely. If you choose to give your cats scheduled meal times, you get to closely monitor their food intake. 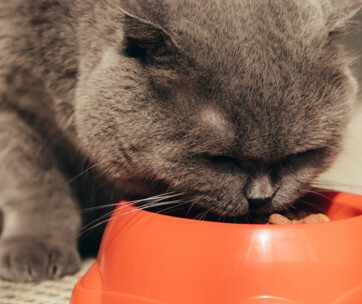 This could help you prevent your cat from becoming either over- or underweight. You’ll also get to see if your pet has a sudden change in appetite, which could be due to sickness or from growing tired of a certain food item. You can easily make modifications to get your cat back to feeling their best again. It doesn’t take much effort to keep up a cat feeding schedule. Kitten food needs to be given three times a day on average, while adult cats can bear with only being fed once or twice on a daily basis. Another advantage of a fixed feeding schedule for cats is not having one cat dominate over all of the others. This applies to multiple cat households that have the biggest or oldest cats eating and/or taking all the food from the smaller and younger ones. Because you’re in attendance during their feeding, you can make sure this doesn’t happen anymore. The bigger cats don’t get overweight, while the smaller cats are sure to get as many important nutrients as they need. There are disadvantages to this method of feeding, though. For instance, busier pet owners just don’t have the time to keep track of what their cat eats, let alone be there every time that they do. More active cats may also grow hungry and weary during the times in between meals. They may grow restless and start begging for food. Don’t give in to this, however, as this may result in your cat gaining extra weight. Just make sure to follow your veterinarian’s feeding advice because if you do, you’ll be competent in the fact that your cat is getting the right amount of calories and other necessary vitamins and minerals. The next cat feeding schedule you can follow is known as free feeding. As its name suggests, this is a schedule wherein you let your feline eat whenever he or she pleases. Some cats like to eat larger amounts of food every couple of hours, while there are those that like to eat little by little throughout the day. Only dry cat food can be used for this feeding option, as wet food could go bad if left out for too long, especially in warmer environments. If your pet prefers to eat wet foods, then you may want to consider other options. As with a fixed schedule, free feeding also has its distinct advantages. First and foremost, it is the perfect schedule for busier cat owners. You can just leave a bowl of dry cat food in your cat’s vicinity that they can eat by themselves in their own time. You don’t need to be there to supervise the entire time they are eating. You can provide minimal supervision if needed, but a free feeding schedule also lets you do other things as well while your pet practices being more independent. Another advantage of a free feeding schedule is that cats get to eat according to how they feel. There are cats that don’t eat enough when fed because maybe, they were still full from their last meal. Since they didn’t eat enough in their latest meal time, they may get hungry by the time the next one rolls around. Eating multiple small meals throughout the day instead of eating big meals every couple of hours can also help your cat maintain an ideal weight. However, if the opposite happens and your cats stuff themselves whenever they please, then you might have a sick overweight pet in your hands in just a couple of months. Not only will you be losing money buying food again and again because of how fast your pets eat. Veterinary fees and medications for cats can also become eye-wateringly expensive. A workaround for this is to measure the necessary food for your cats per day. Don’t fill up the feeding bowl once the food is gone. If the food is gone, it means that your cat has already gotten its nutritional needs for a given day. This signals to your cat that he or she has to properly portion the food given. Lastly, we have a combination feeding schedule. 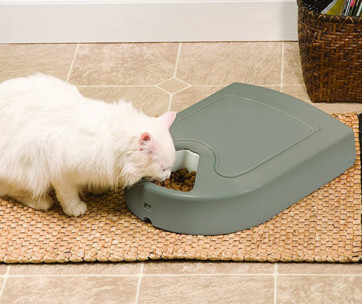 Like its name suggests, this option lets us have the best of both worlds when it comes to feeding our cats. It may be hard to find the right balance at first, but sooner or later, you will be reaping most of the benefits of a fixed feeding schedule as well as a freer one. This also lets your beloved pet enjoy the flavors and textures of both canned and dry food items in a single day. In combination feeding, you give your cat more independence when they are consuming dry cat food. This type of food is easier on an owner’s pockets because it stores better compared to its wet counterpart. Dry cat food is also better for cats’ teeth. On the other hand, you should provide a considerable degree of supervision when you’re letting your cat eat wet food. Wet cat food is favored among felines with urinary and kidney issues. Unlike in a completely free feeding schedule, here, you can monitor changes in your cat’s appetite. If they suddenly prefer one food consistency over the other, or if they eat smaller amounts of food than normal, then it may be time to consult a professional. They could recommend changes to your pet’s feeding schedule that can get their nutrition back on track. If you have a lot of cats, it may not be the best idea to make use of a combination feeding schedule. This is because it could be hard to keep track of their individual food intake, which could lead to some cats being overweight while others don’t get enough nutrients. This may also be time-intensive for some pet owners, as it requires some degree of effort in measuring out just the right amount of food a cat needs for each day. 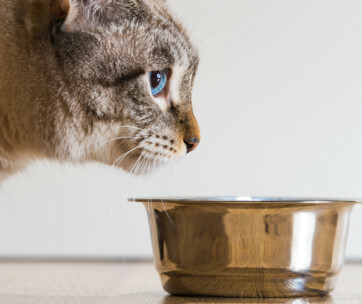 Now that we’ve talked about how often you should feed your cat, let’s not forget about how often your cat should drink. If you’re just giving them clean water without any additives, then most cats can live with a free drinking schedule. Just make sure they have a water fountain that can handle the job. Simply using a bowl may lead to the water being contaminated by things such as food and fur. You should make sure that you constantly refill your cat’s water fountain, especially when the warmer months roll around. When looking for a water fountain, you should look for a number of factors. First, it should have a filtration system that ensures any contaminants are removed from the water before consumption. Some units do this externally, while others have a mechanism inside that does this job. You should also look for an energy-efficient water fountain, especially if you are planning for it to be in use for the entire day. Also consider how many cats you have in your household. If you only have a few, then you can get a way with a compact, space-saving water fountain. If you have multiple cats in your household, maybe consider splashing out on a larger unit to make sure that everyone gets the chance to get a sip of water. Avoid water fountains with BPA in them, as this may be harmful for your beloved pets. Now you know how often you should feed your feline. Hopefully, there will no longer be any stress related to mealtimes any time soon. Just choose the cat feeding schedule that suits your situation the best and you’ll get to see how much of a positive difference something as simple as this can make.